Summary: This fascinating examination of the earliest years of Christianity reveals sharply competing ideas about the significance of Jesus and his teachings and shows how the man we call St. Paul shaped Christianity as we know it today. Historians know almost nothing about the two decades following the crucifixion of Jesus, when his followers regrouped and began to spread his message. During this time the apostle Paul joined the movement and began to preach to the gentiles. Using the oldest Christian documents that we have—the letters of Paul—as well as other early Christian sources, historian and scholar James Tabor reconstructs the origins of Christianity. Tabor reveals that the familiar figures of James, Peter, and Paul sometimes disagreed fiercely over everything from the meaning of Jesus’ message to the question of whether converts must first become Jews. Tabor shows how Paul separated himself from Peter and James to introduce his own version of Christianity, which would continue to develop independently of the message that Jesus, James, and Peter preached. Based on my father's review for PAUL AND JESUS: HOW THE APOSTLE TRANSFORMED CHRISTIANITY by James D. Tabor, I might have to reconsider my initial impressions on this book. I usually don't read much history or religion, but he makes a very strong case for picking up this book. 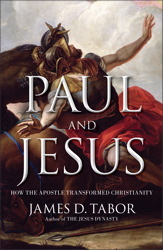 In PAUL AND JESUS: How the Apostle Transformed Christianity, author James D. Tabor examines how St. Paul shaped modern Christianity. Tabor, a biblical scholar and historian, uses ancient documents, the Q source (earliest collection of teachings and sayings of Jesus) and the original letters of Paul to lay out his positions on the influence of Paul on Christianity. Tabor’s basic tenet is that the Christianity that Catholics and Protestants practice today is derived from Paul, not Jesus. Tabor tells how Paul moved from being a devout Jew and persecutor of the followers of Jesus to later carrying the message of Jesus to the Gentiles. Paul never met Jesus in the “flesh” but claims to have experienced repeated revelations from the “spiritual” Jesus. Paul carried his message based on his revelations to the Gentiles while James and Peter, who actually knew Jesus, led a movement that incorporated the teachings of Jesus into traditional Jewish teachings. According to Tabor there is sufficient evidence to indicate that James, Peter and Paul had major disagreements over their teachings. Paul’s views of Christianity ultimately won out and James’ and Peter’s “Jewish-Christianity” gradually disappeared. Tabor contrasts his views of the Christianity taught by James and Peter to that taught by Paul. He makes some interesting comparisons regarding Judaism, Baptism, the Resurrection and the Last Supper. Tabor presents to the reader his analysis of the New Testament’s strong Pauline influence to support his position of Paul’s importance in today’s Christianity. The author also presents an interesting chapter about the historical Paul. Through his 30 years of research and clear writing style, Tabor presents in PAUL AND JESUS an interesting scenario that challenges the thinking about the origin of today’s Christianity. Some of the information may make some Christians uncomfortable, but even if one disagrees with Tabor’s conclusions, he gives the reader a real understanding about the period of history that witnessed the birth of Christianity. I recommend this book. Jim and I love books on the history of Christianity, so we would be good customers for this one! Thanks for the great review! This does sound fascinating but I wonder if it's too academic for me. I would have never considered this but Booking Pap Pap may have changed my mind.